Believe it or not, Lanee Keh-Tan, interior designer and co-owner of home décor and furniture showroom Maison 68, had given birth only three months before the MEGA Stylephile shoot for the July 2012 issue. With her youthful glow and sweet, amiable personality, she looks more like a girl fresh out of college than a new mom! The only thing about Lanee that hints at the fact that she is a new mother is how busy she is these days, taking care of the family business and Maison 68 while "juggling with adjustments with mommyhood," as she puts it. But she seems to be having a good time as she juggles everything in style. Check out these behind the scenes photos from the shoot and see for yourself. 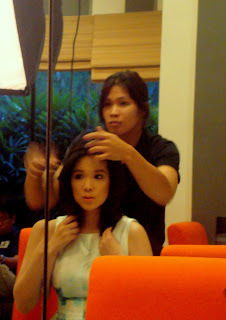 Eduard Francisco of Bench Fix did Lanee's hair while Tina Sevilla of The Face Shop dolled her up. She was photographed by Ed Simon and directed by Yselle "Ysa" Reyes, who also did the art direction for last month's Stylephile featuring Nadine Howell and this month's MEGAWOMAN featuring Katrina Ponce-Enrile. Among the outfits Lanee chose for the shoot, my top pick would have to be this dainty, fresh and sophisticated number: a silk floral tulip dress from Zara, Manolo Blahnik bejeweled heels, a bangle from Panopio and dangling earrings by Vida Lim. Too bad I forgot to take closeup shots of her accessories 'cause the bangle and the earrings are just so lovely! Among the things Lanee loves to collect are belts, and she owns quite a variety! The ones above are her favorites from Hermès. Read more about Lanee Keh-Tan and her top style picks in this month's MEGA.